I was so excited to get this order, because I've heard so many things about ColourPop Cosmetics. I could hardly contain my excitement when the package arrived at my door. I immediately tore it open and started swatching and I'm totally ready to share my thoughts, feelings, and swatches with you. Are you ready? So, I went a little nuts, but at $5 each, how can you not?! I've been on a makeup buying kick for quite some time, and there's no end in sight. As long as makeup companies are releasing makeup, I'm there to buy it. Maybe I'm a crazy woman, but I just can't say no to new makeup and that's how this happened. I've got quite a collection of the Makeup Geek eyeshadows and recently I purchased 6 more. There are still others that I want and more being released soon, which is totally exciting. Anyway, here are the 6 I bought...this time. Yes, I did use the descriptions from the Makeup Geek site. I'm super sick, doped up on cough medicine and too lazy to try to think at this point. I have a fever and I'm a little loopy...it's not my fault. 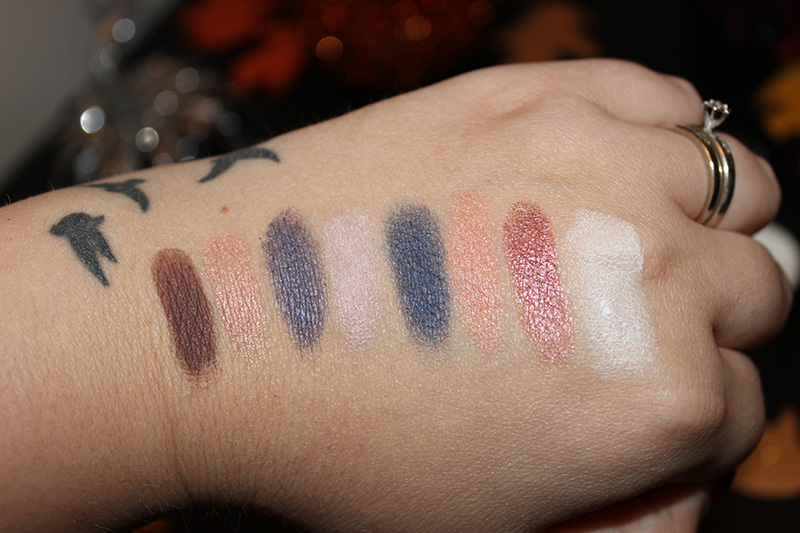 Oh, and here are some swatches. 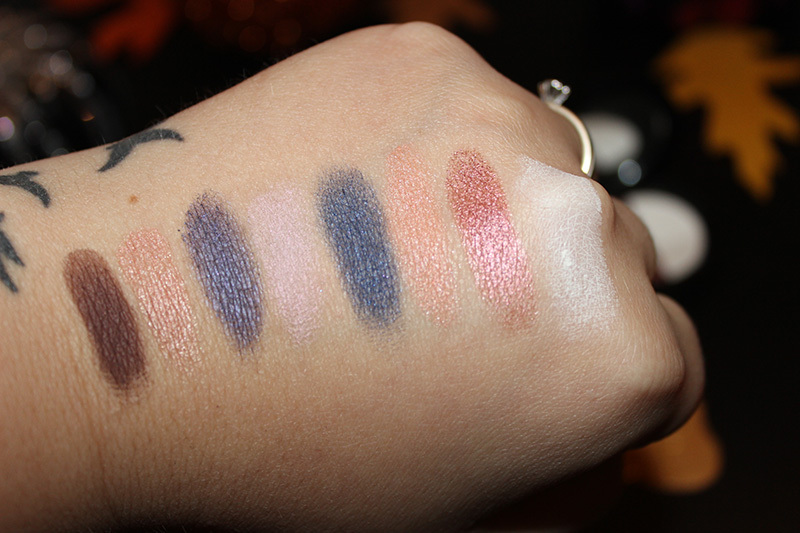 As always, colors are beautiful, formula is awesome and pigmentation is great. They are super blendable and amazing. I totally recommend buying all of them; they're only $5.99 each! So affordable. The quality is great and color selection is awesome. Sorry for the short review but I'm sick and I'm not really feeling like a long one today! Soon I'll post my entire Makeup Geek collection, if you'd like to see it! I've been in a makeup buying frenzy lately, and this is one of the things I picked up. I finally decided to post my review of the Urban Decay Anarchy Face Case. I originally didn't intend on posting this, as it's something that's been out for quite some time, but it's currently on sale at Sephora for $29. First, let's talk about the packaging. The case is cute, I really like the design. It snaps closed, the top opens to reveal eyeshadows, and there's a second closure below it that you can open to get to the blushes. The top closure opens without a problem. The bottom one is SO hard to open. I literally have to force it open with tweezers. It's insane. The entire case is plastic, but it seems secure and I think it will be fine for traveling. As you can see, this comes with 5 eyeshadows, 2 blushes, a highlight, a travel size 24/7 Eye Liner pencil in Perversion and a full size super saturated lip crayon in Scandal. Let's take a closer look at the eyeshadows and the swatches. From left to right we have: Redemption, Fray, Vaporize, Provocateur, and Revolt. The blushes and highlight are SO pigmented, but they blend out really well. The lip color is called Scandal, and the eyeliner is Perversion. They're both opaque in one swipe. The range of colors is nice, two blush options is great, and the highlight is a bonus. I'm already a huge fan of the UD 24/7 liners and Perversion is seriously black. Scandal is a beautiful hot pink/red shade, and I can't wait to wear it. You can't tell from the picture, but it has small shimmer particles in it. You can pick this palette up at Sephora for $29. Today I'm reviewing the Lorac Pro to Go palette. I was so excited to get this, and now I'm going to share it with you! Let's talk about packaging. This palette can be opened from the top or bottom; one end has the eyeshadow shades, the other has the cheek colors. This is all held together my a magnetic closure, and can fully open as shown above. This way this palette is set up makes it ideal for travel because of its compact size. It comes with two brushes, one angled and one "fluffy". I haven't used either, yet. This palette contains 6 eyeshadows, 3 are considered shimmer while the other 3 are considered matte. It also has one shimmer blush, 1 matte blush and a matte bronzer. These retail for $5.99 each. I only own one MAC eyeshadow, but these are the same quality in my opinion, for a fraction of the price. As I've said before, these shadows are just awesome. Pigmentation, blendability, softness, application, staying power, it's all perfect. I love them, and they are SO worth $5.99 each. Also, in case you were wondering, I just keep mine in a MAC Pro Palette, they fit perfectly. 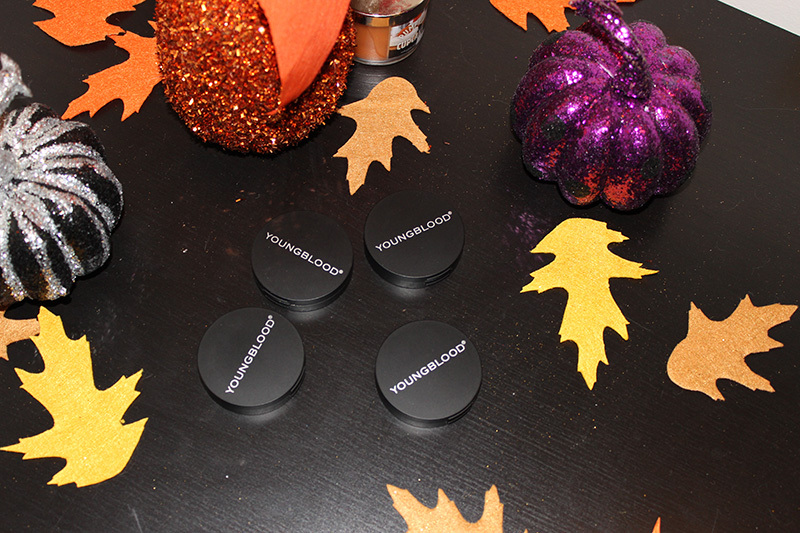 I finally purchased the Makeup Geek eyeshadows after hearing they were so similar to MAC eyeshadows. I knew I had to try these because I've been watching Marlena on youtube for years! She was the very first beauty guru I ever watched, and she's absolutely amazing. She has some of the best tutorials, and I love her reviews. Anyway, let's see the shadows I bought. Cosmopolitan is described as a Rose gold with gold flecks. I purchased this one because it's supposed to be a dupe for MAC Expensive Pink, and I've had my eye on that eyeshadow for a long time. This eyeshadow is extremely pigmented and blends nicely. Mermaid is described as metallic teal with gold reflects. It's supposed to be comparable to MAC Parrot. Depending on what base you use with this color, it can look very different, which is really nice. I love versatile eyeshadows. Unfortunately, the pictures below don't show it's versatility as well as I had hoped. This eyeshadow is very pigmented, versatile and easy to blend. Peacock is described as matte deep teal blue. I bought this because I've had my eye on MAC Plumage for a while, and I thought this looked similar. I don't have Plumage, so I can't compare them for myself. This eyeshadow is smooth, pigmented and blends easily. These retails for $5.99 for the pans or $7.99 for the compact. I totally recommend purchasing a MAC palette or a Z palette to put these in, because there's no way you're only going to buy one. I can't wait to purchase more of these. 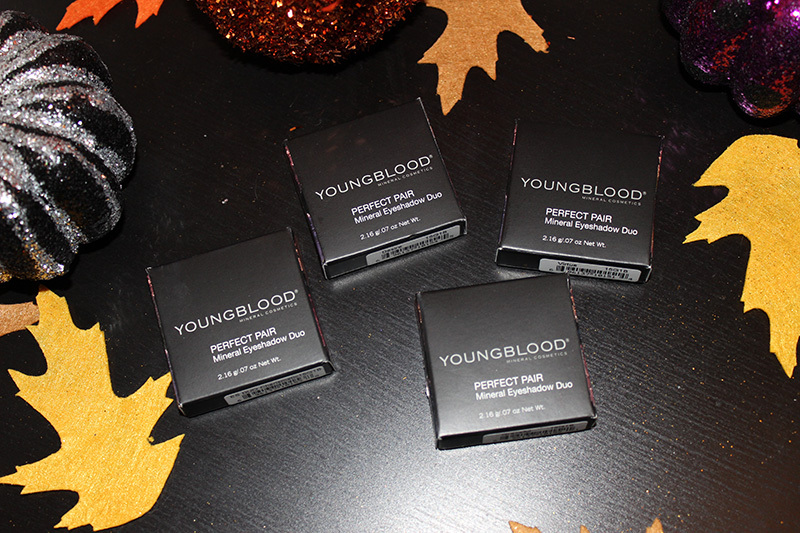 The pigmentation is on point, they're so easy to blend, they apply smoothly and they're such great quality. 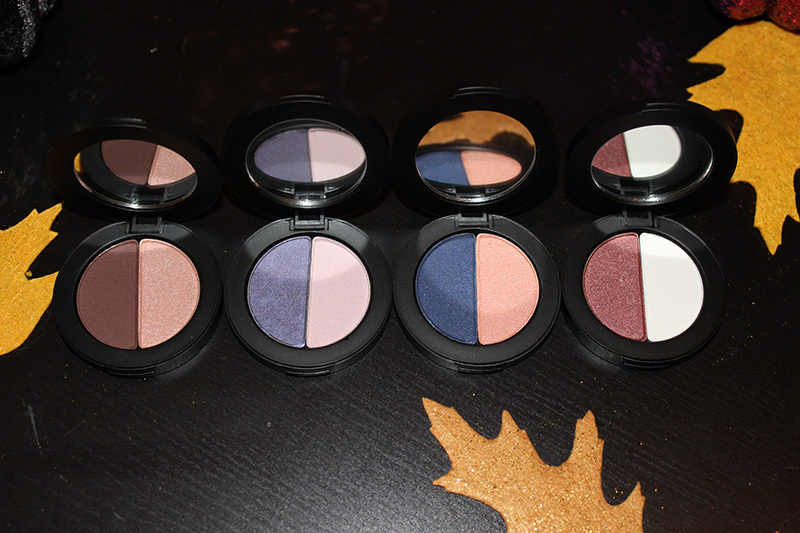 I'd definitely say that these are comparable to MAC shadows, and are better quality than some MAC shades I've tried. What colors should I pick up next? Leave suggestions in the comments! Thanks for reading. Don't forget to enter my giveaway!